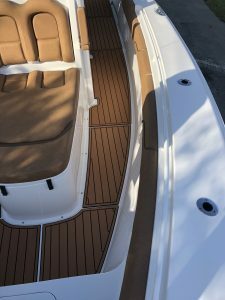 Marine Customs, LLC is a marine decking fabricator and installer for closed cell EVA non-skid decking throughout the East/Central Florida regions. 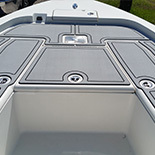 A simple and practical alternative to the traditional non-skid surfaces for all types of boats, personal watercrafts, air boats, kayaks, houseboats, Stand Up Paddleboards (SUP), scuba tank protection, RV’s, golf carts, off-road vehicles, etc. If it gets wet, we have the non-skid solution for you! A perfect non-skid custom installation starts with a perfect pattern. Every boat is as unique as its owner! 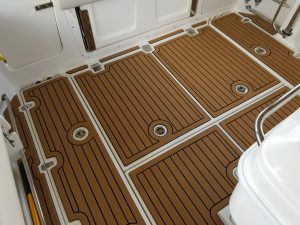 To truly achieve an exact fit for your non-slip decking, we perform a 2D digital scan of your boat which is transcribed into our CAD software to create the exact blueprint for your custom project. 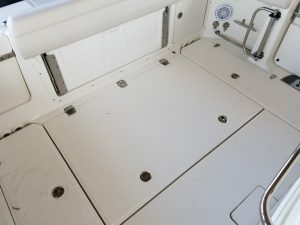 The most common and popular service we provide is a totally custom and unique installation for any boat. This involves our Custom Design Consultant creating a 2D digital scan of your boat. The digital scan is then imported into our CAD software where they are customized which may or may not include any custom patterns, graphics or logos the customer desires. The anti slip decking material is then fabricated on a high precision CNC machine. 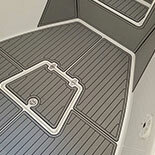 Lastly, our Custom Design Consultant expertly installs the finished product on your boat to complete your custom look. NOTE: Onsite digital scans of your project are currently only available in the following counties: Brevard, Indian River, St. Lucie, Martin, Palm Beach, Osceola, Orange, Seminole, Volusia, Flagler. 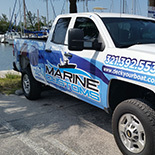 Many boat owners located outside of our service area choose a “semi-custom” route for their project. You may elect to use one of our Template Kits to template your own boat. Once we receive your completed template, it is processed by us exactly as it would be in a “Full Custom” installation. Dry fit templates are then created and sent to you for a final fit verification before your project is fabricated. Once the fabrication of your materials has been completed, we ship them to you for a self-installation of your project. If you’re interested in purchasing a template kit, please give us a call to process your order and we’ll have one shipped out immediately. Note: Your choice of colors do not impact price. However, select colors are in stock locally on a regular basis which may reduce fabrication time by as much as two weeks.